Wyoming had no state building; its appropriation of 25,000 dollars was devoted entirely to exhibits in the Palaces of Mines and Metallurgy and Agriculture. In the Palace of Mines and Metallurgy, attention was immediately attracted to the State's exhibit of oils. Lumps of bituminous coal, weighing ten tons; of soda, weighing 5,000 pounds from the natural soda lakes of Albany county, were to be seen. There were specimens of iron running 75 percent pure and fine copper ore was displayed in abundance. 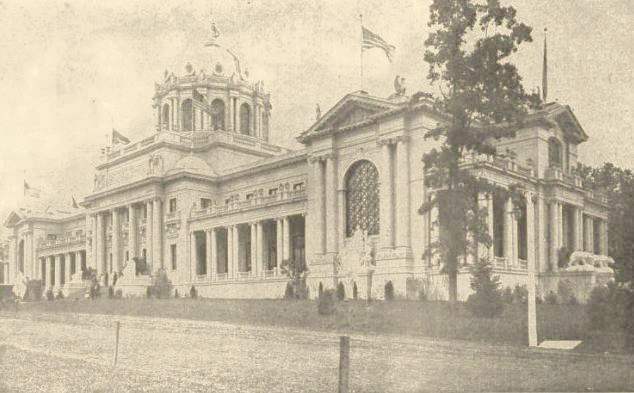 The Palace of Agriculture, contained Wyoming's exhibits of grains, grasses and fine woods and vegetables and fruits. Their alfalfa display won grand prizes. At the Palace of Mines, the state exhibited a large pyramid of the different varieties of onyx, weighing about 40,000 pounds; also a beautiful mantel and fireplace manufactured from the same material. Wyoming also exhibited one piece of natural soda, weighing 5,000 pounds, taken from a natural soda lake near Laramie, in Albany County. All told, there were 156 varieties of minerals, aggregating more than 3,000 classified exhibits. Wyoming was one of the few states to have its exhibit practically complete upon the opening day and thus was dedicated on April, 30, 1904, though Wyoming Day was celebrated on July 11th with a military parade and other ceremonies, finishing with a reception at the Innside Inn. One person in every fifty residents that lived in Wyoming saw the World's Fair. The commission printed and distributed over 500,000 pamphlets to visitors on information about the resources of Wyoming. A display of Wyoming Oils.